The following page provides a detailed trip report and photos from a two-week trek that my sister and I made along the Walker's Haute Route from Chamonix (France) to Zermatt (Switzerland). This was a marvelous adventure of snow-capped Alps rising out of spectacular valleys, delightful Swiss villages and remote alp hamlets, flower meadows and fragrant forests, icy streams and majestic glaciers, and much much more. A true European hiking experience: (1) Edelweiss; (2) Hiking through the alp hamlet of Jungen (Day 11). In July 2013, I hiked the Walker's Haute Route for a second time, this time with my parents. The experience was even more marvelous and memorable the second time. Click here to go to my trip report: Walker's Haute Route 2013. In the early summer of 2005, my sister and I spent two weeks backpacking along the Walker’s Haute Route. The Walker’s Haute Route begins in Chamonix, France and ends in Zermatt, Switzerland; in-between is 180 km of trail and road through some of the most beautiful parts of the Swiss Alps. 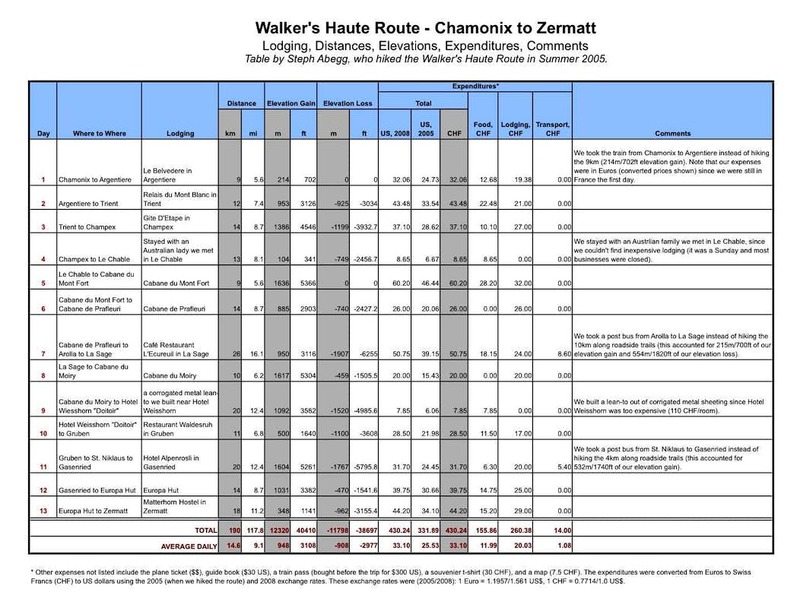 (Note that the Walker's Haute Route is different from the true Haute Route (often skied) from Chamonix to Zermatt: while the two routes sometimes overlap, the Walker's Haute Route is a non-technical backpacking trip on trail and roads, while the Haute Route is a more technical high traverse involving glacier travel and more off-trail terrain.) During our fortnight of our adventure on the Walker's Haute Route, we found ourselves in a wonderland of snow-capped Alps rising out of spectacular valleys, delightful Swiss villages and remote alp hamlets, flower meadows and fragrant forest, icy streams and majestic glaciers. We spent our nights in high mountain huts or quaint Swiss villages, experiencing the wonderful European mountain culture. Some of the days were quite rigorous: up to 1800m/6000ft elevation gain or loss on some of the legs! Although the weights of our packs admittedly met North Cascades standards, it is very possible to hike this route with relatively light packs since each night you can stay in a hut or hostel and the route passes through several small Swiss villages. We never had a need for a portable stove or more than a few days worth of food. The price of the huts and hostels ranged from 20-30 CHF/bed, expensive by our tenting standards, but it was more than worth it for the unique experience. When we reached the hopping city of Zermatt, we capped off our adventure with a climb of the Matterhorn. This was a true experience in European mountaineering culture: sleeping and dining in a heated hut high on Hornli Ridge, talking to people paying thousands of dollars to be guided up the mountain, and basking in the spectacular Swiss Alps scenery complete with cable car lines and views of Zermatt far below. Although we fell short of the summit by a few hundred meters because of inclement conditions, click here to see the trip report for the Matterhorn. We found Kev Reynolds’ guide Chamonix-Zermatt: The Walker’s Haute Route to be indispensable. In it you can find all the cheaper lodging options (hostels or matratzenlagers), where to buy groceries (you never have to pack more than a couple days of food with you), elevations of all the passes and villages, hiking distances, where to find the post buses, etc. This guide covers every turn and signpost on the Walker's Haute Route, and you'll find you don't even need a map if you have this guide in hand. I would recommend this guide to anyone planning to hike any section of the Walker’s Haute Route. Below is a map showing the path the Walker's Haute Route takes through the Swiss Alps and villages (click to enlarge - it's rather blurry, sorry!). The route is outlined in blue, and the red highlights indicate the places we stayed during our thirteen day trip. 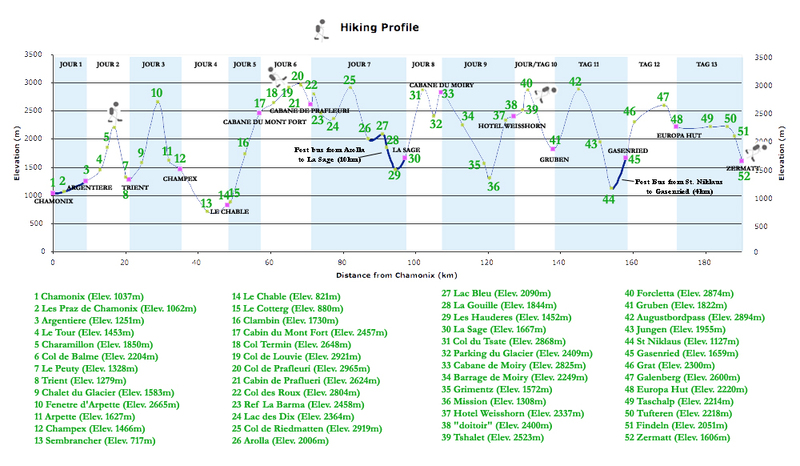 The rest of this page gives a detailed report for each day we spent on the Walker's Haute Route. The challenge of writing this report was choosing a single photo to represent each day! Charts and Tables (locations, lodgings, distances, elevation gains/losses, expenditures, etc.). My sister Jenny on the train to Argentiere. Traveling is tiring! Can’t wait to be hiking! SHORT NOTES: We rode a train instead of taking the 9km trail. We stayed at Le Belverdere in Argentiere, for 12.50 euros each. LONGER DESCRIPTION: While we chose to take the train from Chamonix to Argentiere, there is a 9km trail (with a moderate 214m of elevation gain) from Chamonix to Argentiere. It is a pleasant valley walk through woods and open glades on a woodland path. On the walk to Argentiere there are several opportunities to gaze upon the Mont Blanc massif dominating the valley. As well as having its own train station (most of the towns we encountered on the Haute Route did not have easy train access), Argentiere has a few hotels (cheapest was the hostel La Belverdere at 12.50 euros a bed), a few restaurants, a grocery store, tourist information, and an outdoors store. We bought just enough groceries for the next day’s hike, since we knew the next night in Trient we would be able to purchase groceries again. Because of its proximity to Chamonix and the Tour de Mont Blanc (another popular hike around the Mont Blanc massif), this part of the Haute Route is usually pretty busy. HIKED: 12km, 953m elevation gain, 925m elevation loss. SHORT NOTES: Passed through Le Tour, Charamillon, Col de Balme, and Le Peuty. We bought tuna&egg sandwiches at Charamillon. The Col de Balme was on the border of France and Switzerland. We stayed at Relais du Mont Blanc in Trient, for 21 CHF/bed. LONGER DESCRIPTION: For a first full day’s walking this is a relatively undemanding stage, despite nearly 1000m of elevation gain and loss. The trail out of Argentiere rises steadily among trees, and then drops down to the village of Le Tour. There are signposts marking every junction, as there are on the entire Walker’s Haute Route. There is a gondola lift from Le Tour to the Col de Balme, but it is much more rewarding (and cheaper!) to climb the 1000m yourself, using the grand views of Mont Blanc as a frequent excuse to take a short break. My sister and I stopped at Charamillion (the gondola lift station halfway up the hill) and bought tuna and egg sandwiches. Then we hiked on to the Col de Balme, which lies on the border of France and Switzerland - the rest of the hike all the way to Zermatt will be in Swiss territory. The valley of Trient into which you descend on the other side of the col is green and pastoral. Trient is a quaint Swiss town nestled on the valley floor. It has a few dortoir (hostel) accommodations, as well as a food store and a postbus link. We bought another day’s worth of groceries at the store in Trient. Much of this stage of the Walker’s Haute Route is shared with the route of the Tour de Mont Blanc, so there are plenty of other hikers. Where we slept at the Gite D’etape. We hiked the Walker’s Haute Route a bit before the summer hiking season, so we often had the places to ourselves. HIKED: 14km, 1,386m elevation gain, 1,199m elevation loss. SHORT NOTES: Passed through Chalet du Glacier, Fenetre D’Armpette, and Armpette. We stayed at Gite D’etape in Champex for 27 CHF/bed. LONGER DESCRIPTION:The crossing of the Fenetre d’Arpette (a rugged pass) is a classic outing and one of the most demanding of the whole Walker’s Haute Route (nearly 1400m elevation gain!). A broad grass track leads out of Trient, and becomes a bisse path (a bisse is an irrigation watercourse). After several signposted forks in the trail, the climb to the Fenetre d’Arpette begins in earnest. Frozen cascades of the Glacier du Trient’s icefall are in view nearly all the way up. To the east of the pass lies a whole new world - the descent into the lovely pastoral Val d’Arpette begins with a wild and untamed wilderness of scree and boulders, and finishes with joyful streams, spacious woods, and meadows. At the end of the day Champex is the first "real" Swiss village of the route, with attractive chalets and boxes of flowers at the windows. It’s a popular resort town with several places to stay (all rather expensive, even the hostels, at around 30 CHF/night), a grocery store, several small shops and restaurants, banks, post bus links, a sizable lake, and a magnificent alpine garden. We bought groceries for dinner and the next day. My sister and I met a woman who owned the Gite D’etape, one of the cheaper places to stay due to being a couple of kilometers outside Champex – she kindly offered to drive us there. This hostel was very comfortable and cozy, although we were the only ones there (we were often the only guests, since we hiked the Route so early in the season). SHORT NOTES: Hiked through Sembrancher. When we got to Le Chable we could not find a cheap place to stay, but we ran into an Australian lady named Christine who offered to let us stay at her place in her son’s bedroom. LONGER DESCRIPTION:A gentle downhill walk followed by a pleasant valley stroll makes a good cushion between two rather strenuous days. Although there are no passes to cross, and no big glacier-hung mountains close at hand, the path takes you into an everyday working Switzerland. The hike out of Champex is on dirt roads through pastureland. Whenever you find yourself thinking you are completely lost, another convenient sign will appear to reassure you that you are on the right path. The network of paths and roads brings you to Sembrancher (about 2.5 hours from Champex), a stone-walled village with an attractive little square. Leave the village by walking upvally on the road towards Le Chable. Le Chable is a sizable town with several (rather pricy) hotels, restaurants, shops, banks, and a postbus. We were unable to find lower priced accommodation (it was a Sunday, so most shops were closed and we couldn’t find anyone to help us). We found a bakery that was open, and hung out there eating fresh bread and chocolate. We met a nice Australian lady who offered for us to stay the night on the floor of her son’s bedroom, so we spent the rest of the evening sitting around her kitchen table enjoying tea and talking to our new friends, which was an unforgettable experience. Hiking the trail between Le Chable and the Cabane du Mont Fort. SHORT NOTES: Passed through Clambin. The Cabane du Mont Fort, located high on a mountain hillside, was 32 CHF/bed. LONGER DESCRIPTION:Before we began the hike up to the Cabane du Mont Fort, we stopped at the grocery store in Le Chable and bought a few days worth of groceries since we would be staying in mountain huts for the next two nights. The route from Le Chable to the Cabane du Mont Fort is a combination of narrow lanes, tracks, and footpaths – often steeply climbing, but always interesting. The whole day is spent hiking uphill (over 1600m up! ), but it is only 9km. The trail begins by climbing out of La Chable, passing the quaint white chapel of Les Verneys, scattered timber buildings and chalets, sheep filled pastures, and even an up-scale restaurant perched on the hillside. The trail then crosses and recrosses a bulldozed ski area (it is impossible to escape all sign of the downhill ski industry, for Verbier and its surrounding hillsides offer winter paradise for the skier, and an abundance of lifts and cableways have effectively laced the mountains), but finally emerges onto a bisse path with view of the Grand Combin in the distance. The trail gently climbs to the Cabin du Mont Fort, which stands on a bluff at the junction of trails. The Cabin has an optional full meal service as well as showers, but these options cost more…. Hiking through the basin between the Col de Prafleuri and the Cabane de Praleuri. HIKED: 14km, 885m elevation gain, 740m elevation loss. SHORT NOTES: Passed through Col Termin, Col de Louvie, and Col de Prafleuri. There was really cool ("chouette!") squishy mud in the basin before the Cabane de Prafleuri. The Cabane de Prafleuri was 26 CHF/bed. LONGER DESCRIPTION: This stage is long and tiring, but full of variety and ever-changing views, and the overall elevation gains and losses are not as high as some of the other days. The day starts with a traverse along a hillside to the Col Termin. The Combin massif dominates the scene, and if you remain alert you might spot an occasional ibex. The trail then wraps along the eastern side of the hills, and climbs to the Col de Louvie. A barren landscape greets you in the north-east: the Grand Desert, a wilderness of screes, chaotic moraines, and dying glacier. Here, you are witness to the ceaseless toil of erosion. The way to the Col de Prafleuri is well marked by painted red and white flags, but there is no real path (which could pose a problem in poor visibility). My sister and I found some cool squishy ground and had some fun jumping around on it. The climb to the Col de Prafleuri is somewhat tiring on a steepish slope of scattered rocks. From the col, one is greeted with a view over a scarred and barren mountain bowl, with the small dot of the Cabin de Prafleuri faintly visible on the other side. The cabin was rather new when we stayed at it in 2005. It was a nice cabin, but in a rather barren location..
SHORT NOTES:After hiking to Arolla, we took a post bus (8.60 CHF) from Arolla to La Sage (10km). We stayed at Café Restaurant L’Ecureuil in La Sage for 24 CHF/bed. LONGER DESCRIPTION: This stage of the walk leads from the rather gloomy, man-savaged Prafleuri glen to the delightful village of Arolla. Despite the fact that you have two passes to cross, this stage is not unduly taxing. The hike starts by climbing up towards the Col des Roux (only about 20 minutes from the Cabin de Prafleuri). From here you get a view of the 5-mile Lac des Dix below. The path descends and takes you past a stone-built Refuge de la Gentiane la Barma, which is permanently open. The hike continues upvalley through pastures alongside the Lac des Dix. 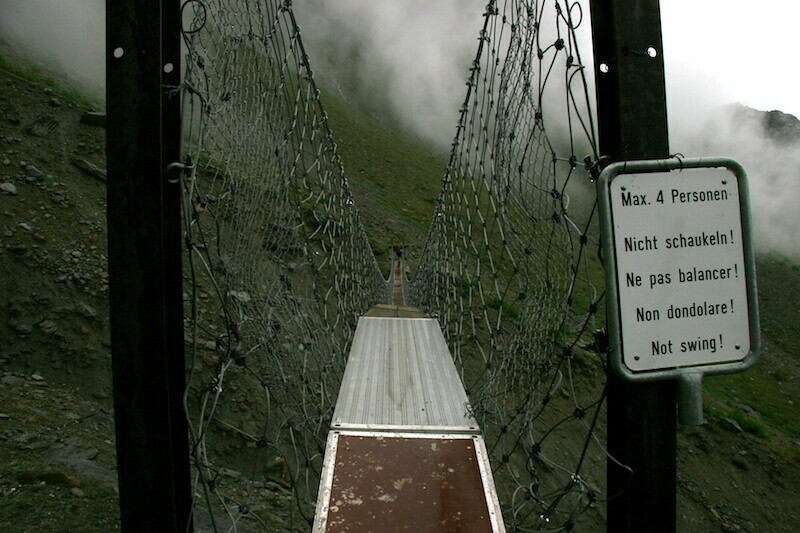 At the southern end of the Lac des Dix is a metal suspension bridge that crosses high above the south-eastern inlet. The path now climbs towards the Col de Riedmatten. The final climb up the gully to the col can be aggravated by lose grit; an alternative is to break off to the right to three near-vertical ladders bolted to the rockface. We did not use the ladders, but I wished we had since they sounded exciting! From the Col, one gets a view of the Pigne d-Arolla, Mont Collon, Aiguille de la Tsa, Dent Blanche, and even the sharp blade of the Matterhorn’s upper reaches far off. Looking back towards the west, if you know where to look, you can make out the tiny form of the Cabin des Dix perched above the glacier (this is a remote cabin a day’s trip off the Walker’s Haute Route, but has a spectacular position and might be worth an extra day). The path then descends the east side from the Col de Riedmatten towards Arolla (it is quite a descent, and the knees get tired, especially after about 16km of hiking). Arolla has accommodations, restaurants, shops, and a post bus link. We restocked on groceries in Arolla (enough for 2 days since we would be staying in a hut the next night), and then decided to take the post bus to La Sage, since the weather had been bad, and we liked the idea of eliminating the valley walk between Arolla and La Sage (this is a 10km hike that is mostly gently downhill through woodlands and small meadows and alp hamlets; although it is possible to connect this 10km hike with the hike to the Cabane de Moriy, this would be a grueling day!). La Sage has a hotel and doitoir, a restaurant, a shop, and a post bus link. SHORT NOTES: Passed through Col du Tsate and Parking du Glacier. Cabane de Moiry had an amazing position overlooking the Glacier de Moiry. Beds were 18 CHF each (the friendly caretakers gave us a reduced rate from the typical 26 CHF/bed). Jenny splurged and bought the meal service (dinner and breakfast) for 28 CHF. LONGER DESCRIPTION:This stage brings you through the lovely Val de Moiry, a tributary glen that feeds Anniviers. The trail leaves La Sage and climbs trails and roads up a hillside past a few alp hamlets. The trail at times disappears in the grassy meadows, but the general idea is to head for the rocky Col du Tsate. The east side of the ridge falls to the Val de Moiry, and eventually brings you to a track which swings to the roadhead Parking du Glacier. From here you can see the Cabin du Moiry perched on a rocky knoll overlooking the Moiry Glacier. Due to its spectacular position, the Cabin du Moiry is a popular goal for both dayhikers and overnighters alike. However, it is quite a climb to reach the cabin. The trail leads up the moraine and then switchbacks endlessly up the rocky slopes. The cabin is well worth the climb. Like all of the high mountain huts we stayed at, the Cabin du Moiry offers a full meal service. My sister decided to splurge and she enjoyed a wonderful dinner of soup, sausage, pasta, and vegetables. The caretakers of the hut were really nice, and one of them gave us each an edelweiss he picked from his tiny garden. We built our own doitoir since the Hotel Weisshorn was much too expensive. SHORT NOTES: Passed through Barrage de Moiry, Grimintz, Mission, and Hotel Weisshorn. Hotel Weisshorn was too expensive (110 CHF/bed), so we built a hut of our own out of some corrugated metal we found at a vacant mountain hut. LONGER DESCRIPTION: The Walker’s Haute Route as described in Kev Reynold’s guide next takes one from the Cabin du Moiry, down into the forested trench of Val de Zinal, and up to the Col de Sorebois before making a steep descent into the mountaineering center of Zinal. An alternate route takes one to the Hotel Weisshorn, which lies to the north of Zinal. The Hotel Weisshorn is set in a magnificent position more than a thousand meters above the valley bed, with the Rhone valley to the north and the chain of the Bernese alps rising above that (Kev Reynolds describes a night spent at the Hotel Weisshorn as "counted among the highlights of the Chamonix to Zermatt walk"). So my sister and I decided to take the alternative route to the Hotel Weisshorn. This involved descending from the Cabin du Moiry to the Barrage de Moiry (either route has to make this descent). We then continued downward to Grimentz and Mission (quite tiring on the knees! ), where we bought groceries. Then the upward hike began, through forested hillside on a well marked network of paths. When we finally reached the Hotel Weisshorn (which was indeed nice, but, to be honest, not as nice as I had envisioned), we were disappointed to discover that they did not have any doitoir (hostel) accommodation as we had thought; being too cheap to spend the 110 CHF each, we decided to hike onwards to see if we could find anything else. But there was nothing but deserted alp hamlets, and we were getting tired from our long day of hiking. We passed a deserted hamlet with some corrugated metal in its yard, and decided to build ourselves a shelter for the night. I enjoyed this night, since it was exciting and cheap, but my sister bemoaned the fact that we had not stayed at the Hotel Weisshorn. Butterfly by the side of the road in Gruben. SHORT NOTES: Passed through Tshalet and Forcletta. Here we entered Swiss German territory (previously everyone had spoken French). We stayed at the Restaurant Waldesruh in Gruben for 17 CHF/bed. LONGER DESCRIPTION: This stage took us over the Forcletta to our first Swiss-German town: Gruben. (Hikers who choose to go to Zinal instead of Hotel Weisshorn also hike over the Forcletta to Gruben). Compared to our previous day, this was a fairly easy day with minimal elevation gain and distance to travel. From the Hotel, a path takes you through the hanging valley on the east side of the Pointes de Nava, past some cowsheds at the alp of Tsahalet, and then up the rocky slopes to the Forcletta, a bare saddle in a ridge stubbed with individual peaklets. The way down to Gruben passes among alp buildings on farm roads. Gruben is a small German-speaking town - consisting of a neat cluster of houses, trim white chapel, and hotel above flood-level nestled at the floor of the Turtmanntal Valley. It was my favorite town we passed through on the Walker's Haute Route, "more like a Swiss village of the Golden Age of Mountaineering than any other." It offers a couple of choices of accommodation and a single grocery store (which stocks a surprising variety of goods), where we got to test our German ("Danke," "Bitte," etc.). We really enjoyed our night at the Restaurant Waldesruh (a children's home before it was converted into a restaurant with matratzenlager accommodation on the second floor), perhaps because the shower and bed felt so nice after a night sleeping on corrugated metal! I went outside with my macro lens and enjoyed an evening photographing the Swiss-German bugs and flowers! Typical way to get water on the Walker's Haute Route, in a hamlet on the approach to St. Niklaus. Jenny above the Mattertal Valley leading to Zermatt. Typical signs on the Walker's Haute Route, on the approach to Gasenried. HIKED: 16km, 1,072m elevation gain, 1,767m elevation loss; 532m elevation gain to Gasenried on post bus. SHORT NOTES: Passed through Augstbordpass and Jungen on our way to St. Niklaus; took a post bus (5.40 CHF) from St. Niklaus to Gasenried (4km). We stayed at Hotel Alpenrosli in Gasenried for 20CHF/bed (this was advertised as a matratzenlager (hostel), but we were given a regular hotel room instead). LONGER DESCRIPTION: This stage was one of the finest of the whole Walker’s Haute Route. The scenery is magnificent. It has a history too, for the Augustbordpass which links the Turtmanntal Valley with the Mattertal Valley was used from the Middle Ages onward as an important trading route between the Rhone valley and Italy. The Augustbordpass is also the final pass on the Chamonix to Zermatt route. Not as demanding as the total height gain and loss might suggest, the hike up to the pass leads through spacious woodland, over high pastures, and into a stony wilderness, but then opens to some of the loveliest views in all Switzerland. Continuing around the mountainside on the other side of the Augustbordpass, we were witness to stunning views of the Weisshorn rising out of the valley, and Nadelhorn, Lenzspitze, and Dom with the Ried glacier pouring into the shoe-horn trough it has carved above Grachen’s green terrace. Then came the descent through the tiny hamlet of Jungen clinging to the desperately steep mountain slopes high above St Niklaus. Jungen is not an unreal tourist haunt, but is a living, working, everyday alp hamlet, one of the last such remote farming communities to be met on the Walker’s Haute Route. From Jungen the path plunges once again into forest, dropping into the shadowed depths of the Matteral Valley past a series of tiny white shrines. The trail leads to the town of St. Nicolas, which has a railway station, several shops, accommodations, restaurants, and banks. By this time our knees were really feeling the nearly 1,800m of downhill. Since we decided to take the high route to Zermatt via the Europaweg (highly recommended), we needed to get to Gasenried. If you plan on taking the original valley route to Zermatt, the best bet is to stay in St. Nicolaus. We chose to take a bus to Gasenried, saving an uphill walk of about 2 hours in order to tackle the demanding first stage of the Europaweg the next day. The bus left from just outside the St. Nicolas railway station. There is only one hotel in Gasenried – Hotel Alpenrosli – but the pricing was moderate (cheaper than anything we found in St. Nicolas). There is also a grocery store and a restaurant in Gasenried. It was Sunday when we arrived in Gasenried, so the store was not open, so we waited until the next morning to restock for our final 2 days of hiking. Fresh bread and chocolate, a usual purchase! This bridge on the Europaweg looks formidable on a stormy day. Escaping from the rain in the Europa Hut. SHORT NOTES: Passed through Grat and Galenberg. Beds at the Europa Hut were 25CHF/night. We had gotten soaked on our hike, so the warm fire and hot tea in the hut were great! Something you don’t find back home in the North Cascades! LONGER DESCRIPTION: Hikers can chose to finish the route by (1) hiking along a series of footpaths on the original valley route to Zermatt from St. Nicolas, or (2) taking the high route to Zermatt via the Europaweg, a challenging 31 km high route between Grachen and Zermatt which was completed in 1997. The Europa Hut – built in 1999 - is situated almost exactly halfway along the trail, so the finale of the Walker’s Haute Route from Chamonix to Zermatt is now a two-day trek along this magnificent path. We decided to hike the Europaweg. From Gasenried, we climbed up towards Grat, a stunning viewpoint where you can gaze upon the chain of the Bernese Alps as well as the unmistakable Matterhorn upvalley. The Europaweg brings you across rocky areas and rough slopes. There are several places along the Europaweg that are potentially dangerous due to stonefall, but these areas are well marked and safeguarded with lengths of fixed ropes or tunnels. By the time we got to the Europa Hut it was pouring, but in no time we were warm and dry, sitting in front of a crackling fire drinking tea and playing cards. 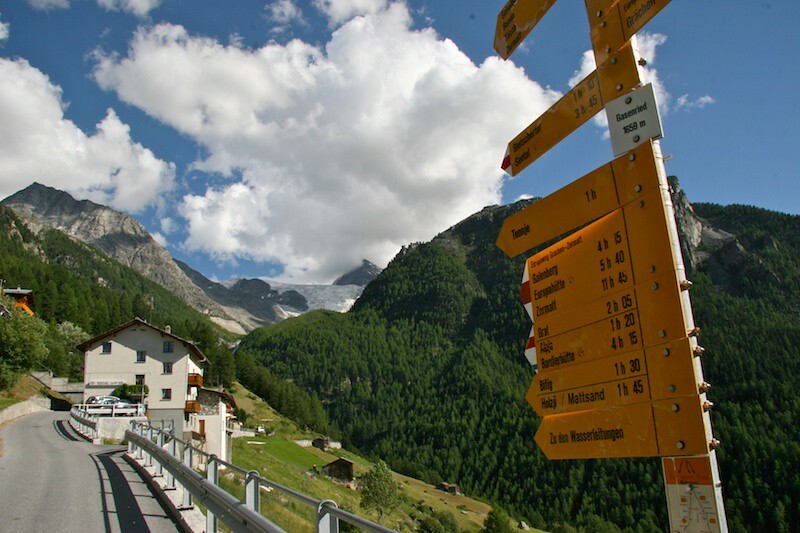 UPDATE: I heard a rumor that in 2011 the Europaweg form the Europa Hut to Zermatt was closed due to slides. I am not sure if this has been re-opened yet, but it just is an example that conditions on the route can change from year-to-year—nothing is ever guaranteed in the mountains! Zermatt and the Matterhorn from the Europaweg trail at the end of the Walker’s Haute Route. SHORT NOTES: Jenny bought the breakfast service at the Europa Hut for 10 CHF. On our hike we passed through Taschalp, Tufteren, and Findeln. We stayed at the Matterhorn Hostel in Zermatt for 29 CHF/bed (this was probably the least comfortable hostel, despite being the most expensive!). LONGER DESCRIPTION: The final stage of the Europaweg makes a worthy conclusion to the Walker’s Haute Route. Visually exciting and fairly taxing because of its distance (though not as demanding as the previous day’s walk), the route is lured on by the Matterhorn which acts as a beacon for most of the way. The height gain and loss are relatively minimal. The Matterhorn came into view less than an hour after leaving the Europa Hut. We were happy that finally the clouds were breaking, since the last couple of days had been quite dreary for us. We also had a few exciting moments when we doubted whether or not we would be able to push our packs through a collapsed section of tunnel, but after much pushing and grunting, we made it through. As we hiked to Zermatt, we passed more and more people and the weather continued to improve, offering fuller and fuller views of the Matterhorn. We hiked through the pretty little alp hamlets of Tufteren and Findeln, and then entered the bustling city of Zermatt. Zermatt has everything – accommodations, restaurants, tourist shops, banks, railway, etc. It was quite a shock to see so many people after being in small villages for the last two weeks. After walking around for awhile trying to find low-priced accommodation (everything is quite expensive in Zermatt), we decided to stay at the Matterhorn Hostel, which is a matratzenlager (ie. low-priced accommodation). It was a bit messier and less comfortable and more expensive (29 CHF/night) than the other hostels we had stayed at during our trip, but it was sufficient. We were able to store our stuff there while we climbed the Matterhorn the next couple of days. We spent the remainder of the day exploring Zermatt and treating ourselves to more Swiss chocolate, Swiss cookies, Swiss yogurt, and fresh bread (these had become our staples), and then went to bed prepared to wake up early the next morning to begin our trek up the Matterhorn. Being an engineer, I like data and charts and graphs…..
Below is a chart summarizing each day of our adventure (locations, lodgings, distances, elevation gains/losses, expenditures, etc.). Click to enlarge. 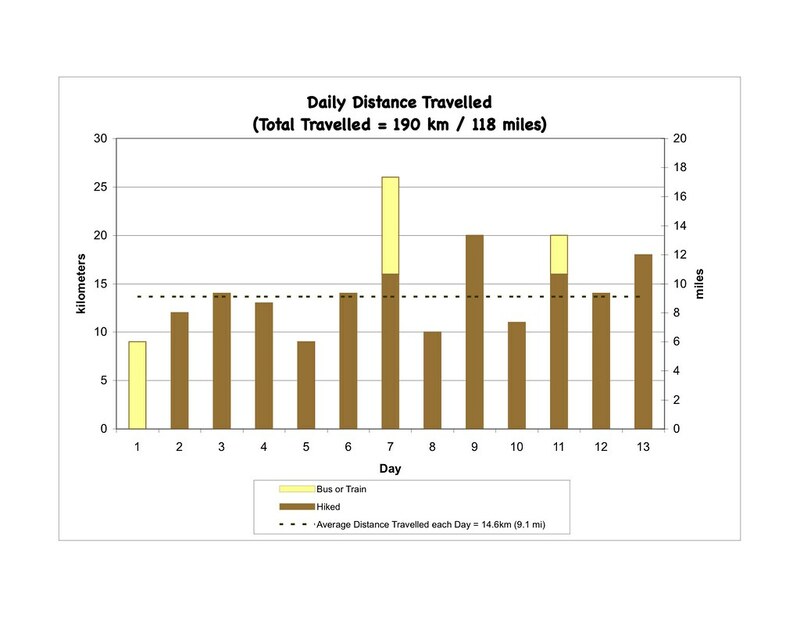 Below is a graph of the daily distance travelled. 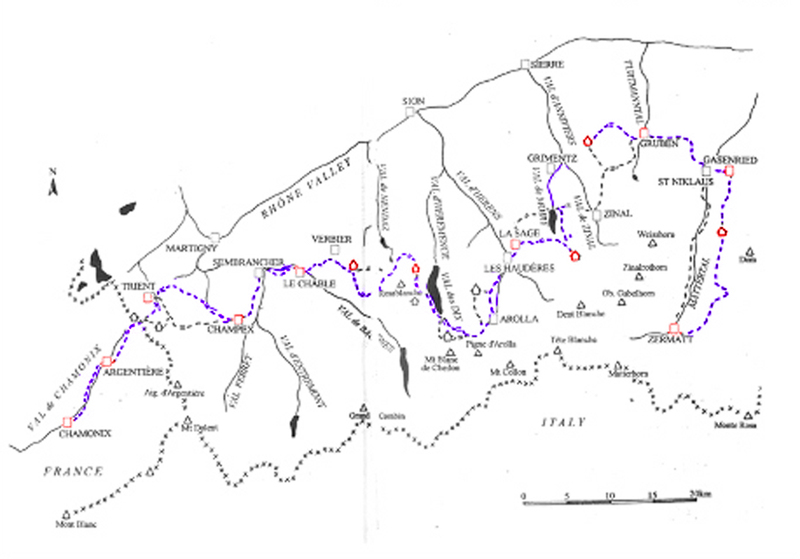 The total distance of the Walker's Haute Route is 190 km (118 miles). The average daily distance was 14.6 km (9.1 miles). 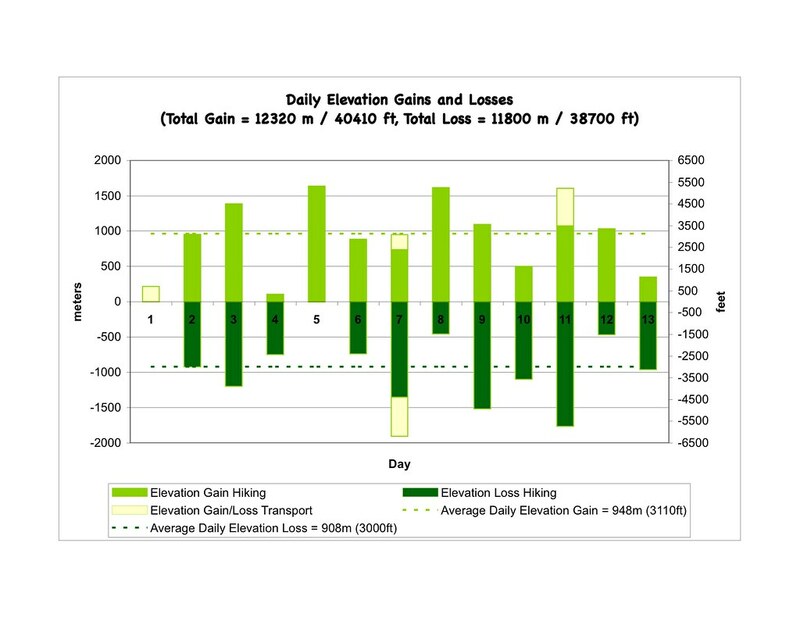 Below is a graph of the daily elevation gains and losses. Some days we gained or lost up to 1900 m (6250 ft)! Our average daily elevation gain was 950 m (3100ft), while our average daily elevation loss was 900 m (3000 ft). One needs to be in pretty good shape to really enjoy the Walker's Haute Route. 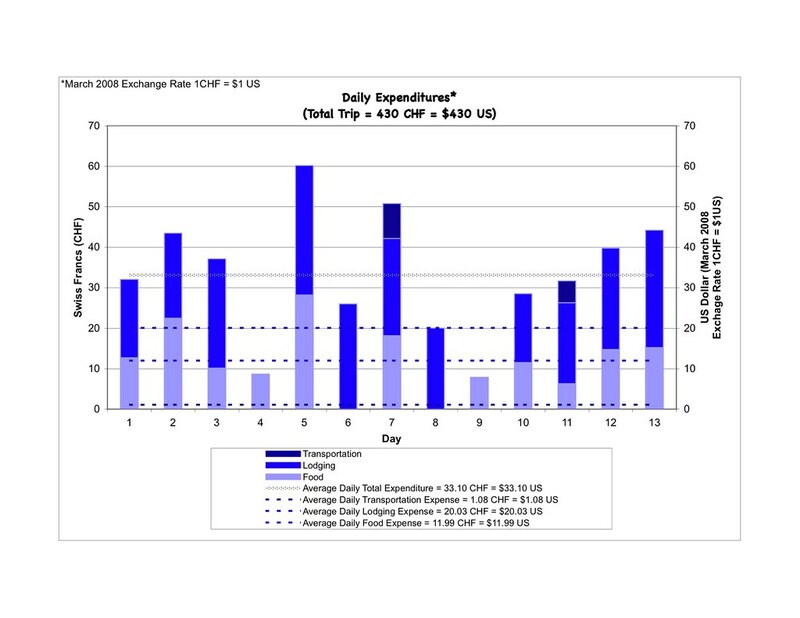 Below is a graph summarizing our daily expenses. We travelled cheaply, buying our food at grocery stores and staying at lower priced "doitoirs" and "matrazenlagers." Our total trip expenditure was 430 CHF (about $330 US in 2005) (this does not include plane flight and trains to and from the Route or any souvenirs). Our average daily expenditure during the hike was 33 CHF ($33 US in 2008 equivalents), spent on lodging (60%) and food (36%) and transportation (4%). And finally, below is a graph showing a distance/elevation profile of the Walker's Haute Route, with the towns, hamlets, passes, and other places of interest along the way labelled.